This simple little drawing holds the key to breaking through some points of inquiry I've been trying to get at for a while. Only I didn't realize I'd been trying. It's funny how when you need something (and I don't mean material things, I mean life lessons), it comes right to your doorstep. 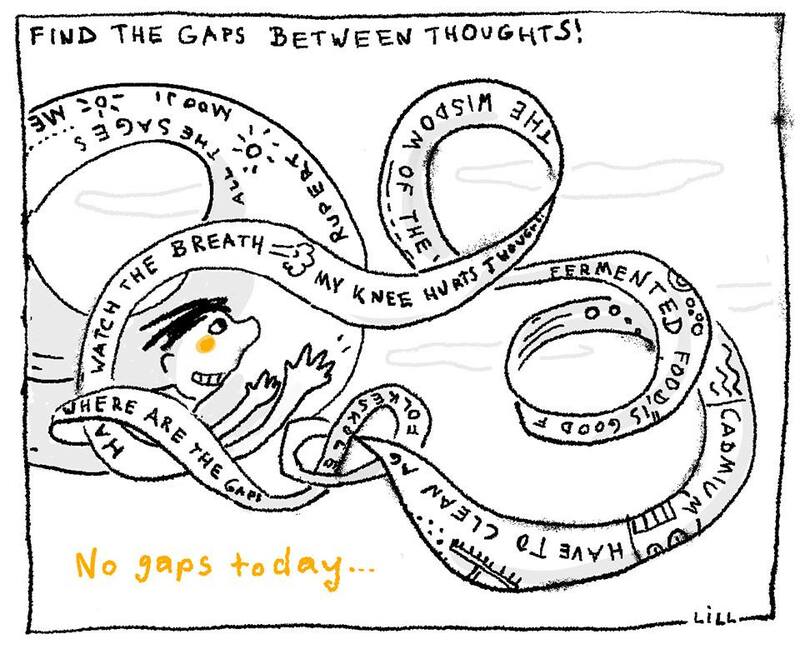 In this case, it came to my computer screen in the form of Ingrid's next doodle in her facebook doodle stream, Just this morning, rather than try to stop my habit of negative thinking, I sat down with it. Like a lot of people, a generalized sense of anxiety about a nebulously uneasy expectation can sneak up on me. This usually happens in the middle of the night and kicks off with one of those dreams with a repetitive themes. For me, the theme is generally centered around an apocalyptic event. A tsunami. Nuclear War. Something fun like that. The secondary theme both within the dream and outside of it seems to be about escape. I just want to run as far from the situation as possible, and without a glance back. I want to escape my own skin. 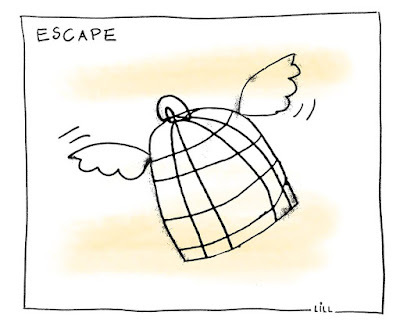 But what if there is no need for escape from anything at all? What if the situation doesn't apply to anyone and is just a situation, happening? What if the troublesome habit IS the self? It has to be because there's actually nothing holding onto it. I just checked. And there was no sign of an owner of a habit. So, if I try to find the thing that escapes a physical situation, it would be the body moving away from a point in space or time. 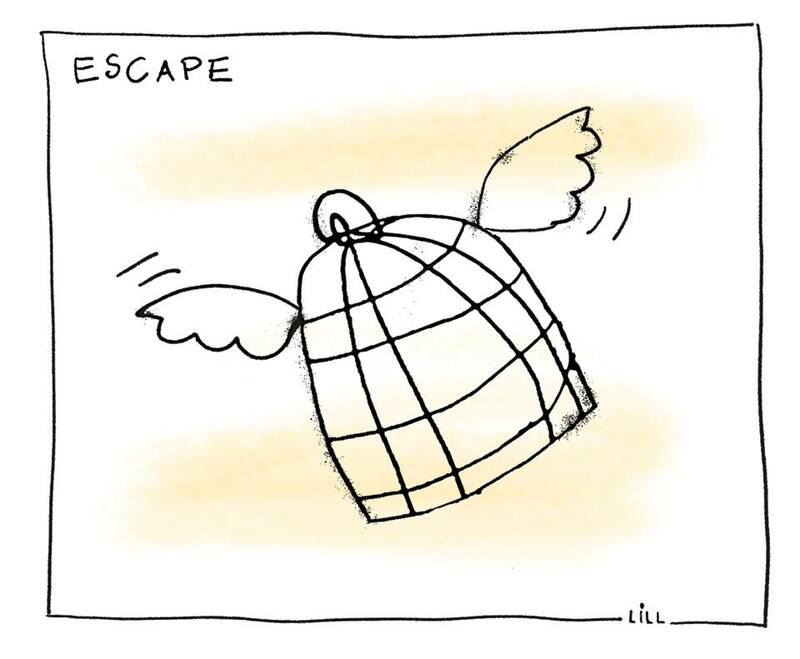 But if it's an escape from the habit of anxiety, it's all about getting away from thought. What would get away from thought? In trying to wrap my head around this doodle, it occurs to me that before using it for inquiry, I really should take a hefty dose of my own medicine by reviewing a few earlier investigations. Because there were two critical turning points in this path- one in which I was astounded to find that there's actually no separate me. The second one was this moment of realization. Bringing the two revelations into this scenario sets up an interesting framework for today's investigation. Why? Well, because if there is truly no separation, then what am I supposed to do with the nearly unquestioned assumption that there's a me doing the thinking and inquiring at all? What IS it that is thinking? This is the first question. 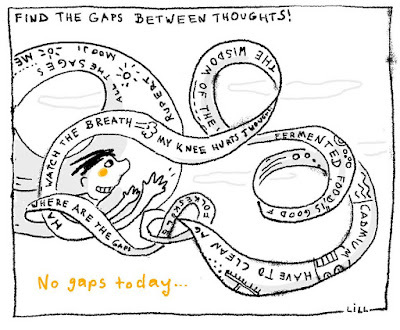 Until it's examined and answered, looking into whether there are gaps just brings up a loop of more thinking. But if I clearly see that there is no separate me doing any of it, then the gap becomes an unbelievably amazing mystery. I mean, what IS that "space"?! Is there anything at all there? The next time I have one of those days in which I just want to choke the incessant voice in the head, maybe all I really need to do is to look for the thinker first. Once this is fully understood, the work on exercises in which I spend hours looking for gaps can begin in earnest, and with abandon. The gaps are thoroughly enjoyed by no one at all.